You have to hand it to Football Federation Australia, who saw the A-League was struggling and took the focus off it with a scandal entirely of their own making. In all seriousness there are some important reasons Alen Stajcic’s sacking as Matildas coach warrants further scrutiny, and it has much to do with how football in Australia is to be governed going forward. We don’t know anything new about why Stajcic was dismissed, but what we do know is how certain FFA members have reacted this week – and some serious questions need to be asked off the back of it. For example, what has new FFA chairman Chris Nikou been up to all week? He was elected to lead the organisation, so where has that leadership been? 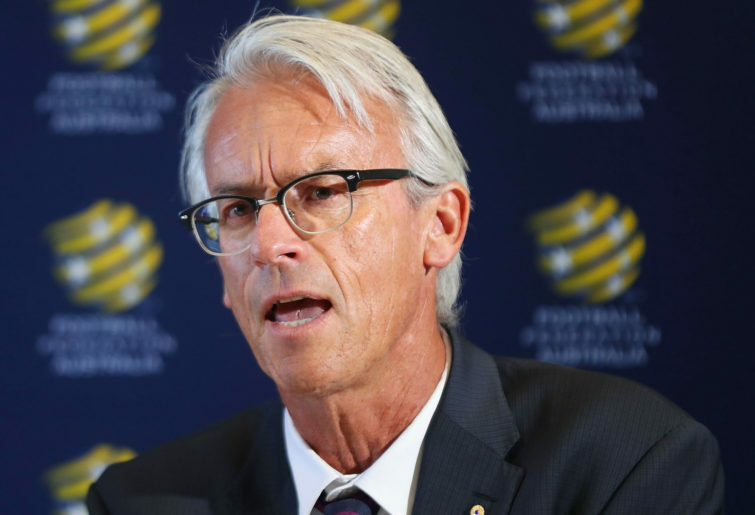 Because for all his corporate experience and legal expertise, David Gallop looked like he’d been thrown to the wolves in that train wreck of a press conference on Monday afternoon. It’s not often a press conference organised by officials conjures more questions than answers, but that’s exactly what Monday’s debacle did. And in failing to definitively address exactly why Stajcic was dismissed, it lead to even more journalists taking a closer look at the situation. Some of the best reporting this week came not from a dedicated football reporter but from the Sydney Morning Herald’s chief sports writer Andrew Webster. His searing analysis included a suggestion from FFA board member Heather Reid that some of those asking questions were essentially conspiring against women. “I suggest that it’s an ugly mess that some people in the media want to push against women of influence,” Reid told Webster. “Certain people in the game want to ruin the reputation of pioneers like myself and Moya Dodd and hard-working people like Emma Highwood just to shift the blame somewhere else,” she added. That is a startling claim for anyone to make, let alone an FFA board member. After days of increasingly acrimonious questioning on Twitter, Reid locked her account last night, meaning her tweets are now only visible to her followers. But that’s certainly not the case for one Lynda Taylor, who I think deserves to be treated with respect. It was Taylor who predicted on January 4 that the Matildas would have a new coach in Rae Dower by the time February’s Cup of Nations rolled around, a fact first highlighted by the always sharp-as-a-tack Bonita Mersiades. Plenty on social media have since suggested that Taylor’s is a burner account, or in other words, the nom de plume of a publicly known player or administrator. But I don’t think that’s the case and there’s a pretty simple reason why. A quick scroll through Taylor’s tweets reveals she’s got some strong opinions about the game, not many of which are complimentary of the FFA. And I can see no reason why anyone would spend almost a year bagging the game’s governing body – and even defend Alen Stajcic – as part of a conspiracy to then have him removed from his job. Instead, I think Taylor is simply a well-connected fan who uses social media to regularly engage with senior figures in the women’s game, including the conspicuously silent – at least as far as this week is concerned – Head of Community, Football Development and Women’s Football, Emma Highwood. Speaking of social media, does the public’s questioning of FFA board members on Twitter this week mean those board members will now no longer use it? What does that mean for the new era of transparency Chris Nikou’s appointment as FFA chairman was supposed to usher in? So many questions still remain around the FFA’s handling of this week’s events that it would do a disservice to the game to ignore them. And for those who feel the finger of blame has been unfairly pointed at them, well, how about walking a mile in Alen Stajcic’s shoes?